It’s time for our Budds’-wide clearance on select 2017 Buick models—featuring 0% financing over 84 months. Thinking about a new Buick? 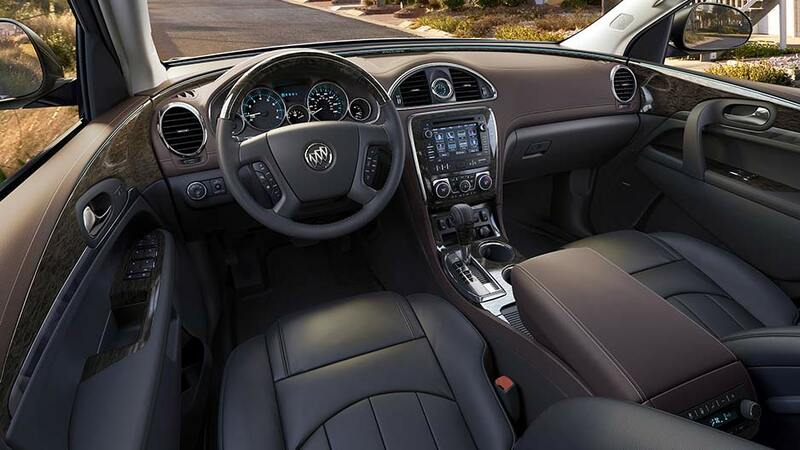 Budds’ has something for everyone, including the Enclave, Encore, Envision, Lacrosse and Regal. Whether you’re single or you and someone else are doing the driving, the Enclave is a comfortable vehicle with a lot of space. That means it’s also great for the kids in the house. 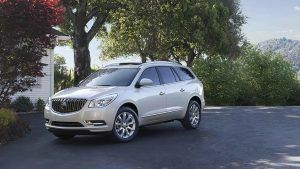 Check out the 2017 Buick Enclave Leather, featuring a 3.6-litre V-6 engine that runs on regular unleaded gas. Comfort features include heated front seats, a leather steering wheel, leather upholstery and power two-way driver and front passenger lumbar support. Plus you’ll be free to enjoy the ride, knowing the Enclave brings along with plenty of safety features—including four-wheel ABS disc brakes, traction control, electronic stability control, brake assist, dual front and side impact airbags, an overhead airbag, an occupant sensing airbag, ignition disable, a security system and a panic alarm. Additionally, a blind spot sensor and rear view camera ensure that you safely move from lane to lane or back up. This model has plenty of perks and a roomy interior, so you’ll be comfortable whether you’re driving the kids to events, commuting or taking a long road trip. 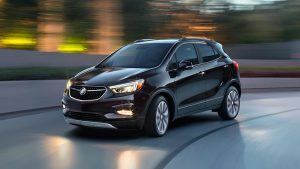 The 2017 Buick Encore Premium features a 1.4-litre intercooled turbocharged engine that makes 153 horsepower at 5,600 rpm. While you’re driving, pass the time with the Encore’s audio system, featuring digital audio input, IntelliLink memory card slot, seven Bose speakers, speed-sensitive volume control, SiriusXM radio, a radio data system and an integrated roof antenna. Convenience/comfort features include a 12-volt DC power outlet, an AC outlet, grocery bag holder, a full console with storage and steering wheel-mounted cruise and audio controls so you can more easily keep your eyes on the road. Additional nice-to-haves include a multi-function remote, remote engine start, and speed-proportional steering. The Envision Essence is another SUV with tons of features. This model features a 2.5-litre engine and all-wheel drive. 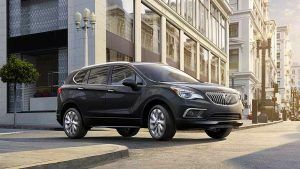 The 2017 Buick Envision Essence also features heated auto-dimming mirrors, an electrochromatic rearview mirror, power with remote tilt and reverse tilt mirror adjustments, turn signals integrated in the mirrors, dual illuminated vanity mirrors, a cargo light to make it easier for you to load and unload at night, a heated steering wheel, and seat and door mirror memory for two drivers. What more could you want? Well, additional features include daytime running lights, remote-activated exterior entry lights, front fog lights, dusk-sensing headlights, one-touch windows, a rear wiper and defogger, rear view camera and auto-delay off headlights. The Lacrosse Essence sedan features a 3.6-litre V-6 engine that makes 310 horsepower and 364 Nm torque backed by an eight-speed automatic transmission with hill holder. The engine also features remote engine start, variable valve timing, 24 valves, and, it runs on regular unleaded fuel. The Lacrosse’s convenience features include two 12-volt DC power outlets, steering wheel-mounted audio and cruise controls, a full center console with covered storage, front and rear cup holders, speed-proportional electric power steering and a universal remote transmitter for the trunk, doors and the remote engine start. 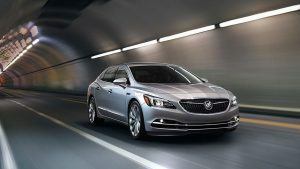 The Lacrosse also features an anti-theft alarm system and an engine immobilizer to help prevent theft. 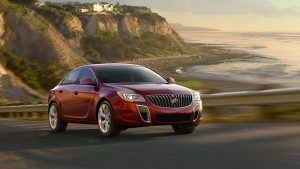 The Buick Regal gives you a sporty, yet comfortable ride. Features include four-wheel ABS disc brakes, brake assist, dual-zone front air conditioning, curtain first and second-row airbags, driver and front passenger airbags and an IntelliLink audio system with an in-dash CD player and SiriusXM radio. The Regal boasts child safety locks to keep busy hands from opening the doors as you are going down the road. Nice touches include front and rear floor mats, a heated steering wheel, a cargo area light, two 12-volt DC power outlets, a full covered console with storage, a mini overhead console, a universal remote transmitter and steering wheel-mounted audio and cruise controls, power windows and variably intermittent speed-sensitive wipers. If you’re curious, a 2.0-litre inline four-cylinder intercooled turbocharged engine makes 401 Nm torque and 259 horsepower. If you’re in the market for a new vehicle and want something with comfort and style, experience our Experience Buick event. Whether you prefer something sporty or need an SUV, you’ll find it in our showroom. Come on by for a test drive!